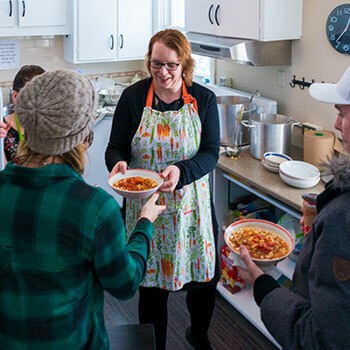 Current students, staff, faculty, alumni and local neighbours celebrated Laurier’s community focus through a variety of events for Laurier Cares week. Laurier Cares week is a celebration of our university’s spirit of caring and is an opportunity to thank all of our community members and partners. There were many ways to get involved during the week, including an on-campus blood drive, a luggage drive, and a random acts of kindness day. During the week, I was able to help serve soup at the Indigenous Student Centre’s soup and frybread lunch (a great event with free soup that takes place every Tuesday) and spent the lunch hour on Wednesday ‘chilling with dogs’ at the Delton Glebe Counselling Centre’s dog therapy program for students. This willingness to help and support each other speaks to the spirit of Laurier. We don’t just pay lip service to our ideal of "inspiring lives of leadership and purpose." We live it every day. My challenge to everyone is to continue this remarkable tradition and carry it with you into the wider community. Reach out and offer your support to a classmate or co-worker who is struggling. Show your appreciation for someone else’s efforts. Share your skills or expertise in a volunteer capacity. We can all find something we can do to improve our community. Laurier Cares is a week of events to remind us of the things we can be doing every day to take care of ourselves and others.